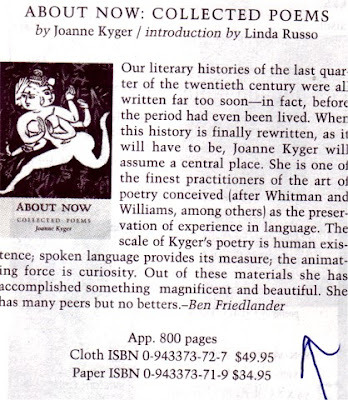 We are very happy to announce the publication of Joanne Kyger's Collected (so far) Poems. We are also very happy that they are being published here in Maine, by the National Poetry Foundation. Again, we are even happier that Joanne will come to Maine and give us several chances to hear her read from these poems. As listed above, the book is 800+ pages, collected from many smaller publications over the years. All This Every Day, God Never Dies, and Phenomenological. The Gulf of Maine is in a prime location on Maine Street in Brunswick. The store is lovely, well laid out, and cozy; but the content leaves much to be desired. Unless one is an angry homosexual or feminist, most of the books in Gulf of maine will not appeal to him or her. It saddens me that in the middle of a tourist area, such a political statement exists; it would be wonderful if the store offerred primarily books on the area and the state. Cons: Politically slanted content only.